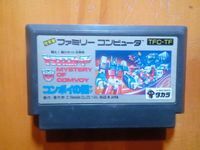 "Transformers: Convoy no Nazo is a 1986 Family Computer video game developed by ISCO and published by Takara exclusively in Japan. It is based on the popular television series Transformers. The game was made available on the Virtual Console on June 10, 2008. The title translates to Transformers: The Mystery of Optimus Prime in English. The game stars Autobot protagonist Ultra Magnus. The box and the cartridge label for the game reads Mystery of Comvoy. This would be a mis-romanization of the Japanese name for Optimus Prime, Convoy. The titular Mystery is the identity of Optimus Prime's killer. In Japan, the 1986 film would not see a Japanese release for another four years. Thus Optimus Prime's death wasn't adequately explained to the Japanese audience; this game was intended to capitalize on that gap." Source: Wikipedia, "MYSTERY_OF_OPTIMUS_PRIME," available under the CC-BY-SA License.